We can use sunlight, the most abundant renewable energy available for our Planet. But to do this, we must improve photosynthetic efficiency. 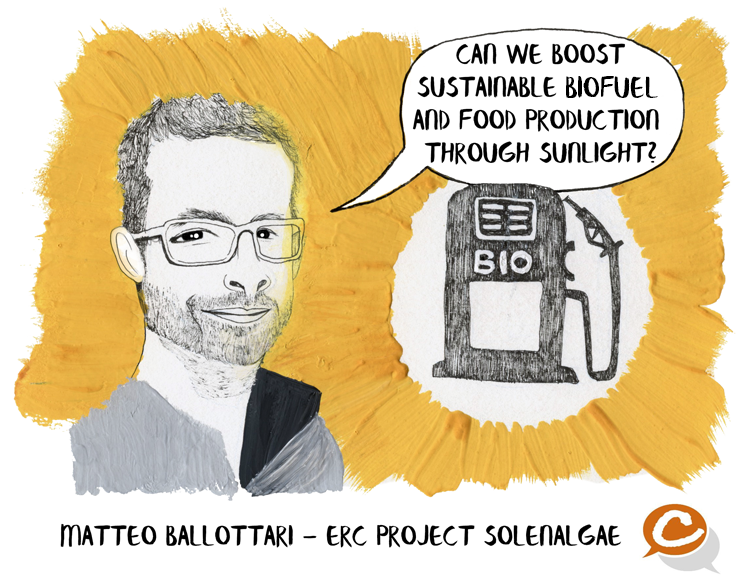 Matteo Ballottari, together with the interdisciplinary SOLE Lab, studies precisely how to "exploit" sunlight at its best to consume CO2 producing biomass. In the framework of the ERC-funded project SOLENALGAE, he focuses on improving photosynthetic efficiency by microalgae. The use of microalgae, or microscopic algae, has many advantages: indeed, they are not in competition with food production and their exploitation is completely sustainable. Today, the main limitation encountered for sustained biomass production by microalgae is just low light use efficiency compared to their potential, but SOLENALGAE will change that!